Fall is the season of cozy fires and romantic evening sunsets, but many summer-lovers look to stretch out the bright days just a little bit longer! For those sun-seekers with a birthday during blustery months, it can be especially nice to find a bright, colorful bouquet on the doorstep. This easy gift can be sent right to them, and it means a lot to know that a loved one thought through their personality enough to find the perfect match for them. One of Heather’s favorite parts of her delivery was the mug, which keeps the party going all year long and brings a smile to the recipient’s face as they remember their special day. In many families – Heather’s included – kids give their parents a gift like this to help build up a family collection. Imagine having a selection of mugs or vases that were thoughtfully picked out by a loved one every single year! You could even give this and send along a favorite drink mix such as hot chocolate, chai tea or coffee beans from a special shop. Check out Heather’s full post about her birthday, and then buy one of Teleflora’s Fun ‘n Festive Bouquets featured on her site! 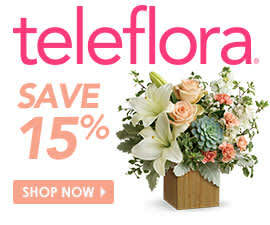 Click to view more birthday flowers or shop our fall flowers.